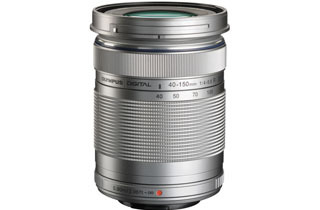 The Olympus M.Zuiko Digital ED 40-150mm f4.0-5.6 R Lens is a high-performance 3.75x telephoto zoom lens with a 35mm equivalent focal length of 80-300mm. A light, compact, and fast-focusing lens that's ideal for portraits and other subjects in the middle and far distance, the 40-150mm has nearly silent focusing technology (a screw drive mechanism that is especially quiet and fast (MSC)) that makes it a perfect choice for recording HD movies with excellent sound. The Micro Four Thirds format brings portability and great optical performance that can capture spontaneous, high-quality photos and movies.